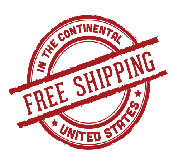 DeLorean Industries offers free standard shipping on all orders over $50.00 within the United States with at cost insured shipping options world wide. Expedited services available domestically and world wide upon request. Use code: BORNINTHEUSA at check out for all domestic orders. Delorean Industries offers a complete innovative product line world wide. Please contact us directly for all international orders as to provide the best shipping quotes available. Simply add prodcuts to cart and sign in/up for an account. We will receive a notification and quote you directly.